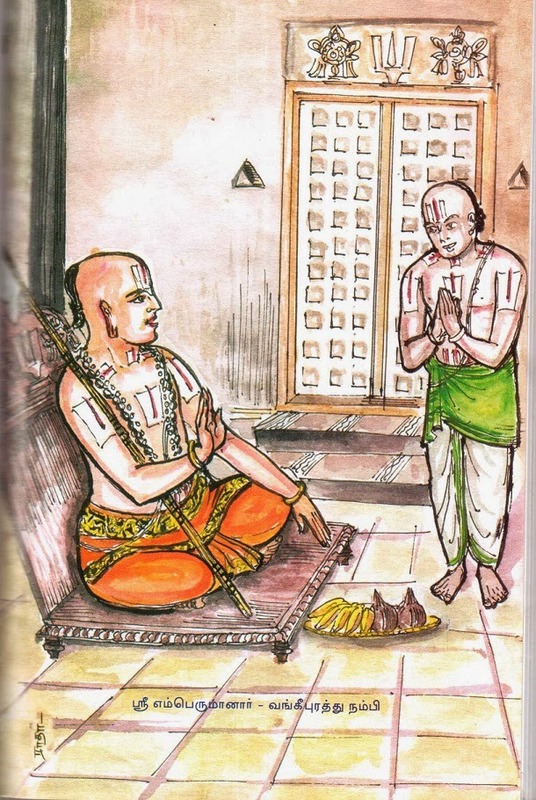 jagadhAchArya srI rAmAnuja is glorified as "kArEy karuNai irAmAnusa" - Most merciful like clouds that freely bless everyone with rain (rAmAnusa nURRanthAdhi - 25) and "dhayaika sindhu" - ocean of compassion (yOnithyam achyutha - thanian). An incarnation of Adhi sEshan, he is popularly known as udaiyavar, emperumAnAr, srI bhAshyakAra, yathirAja, etc. mAmunigaL joyfully reveals the greatness of emperumAnAr's compassion in upadhEsa rathina mAlai 37th pAsuram. AchAryas before emperumAnAr were very selective in sharing/teaching the divine knowledge to others. They would put the prospective sishyas into test fully and ensure that only deserving candidates get the divine knowledge. But emperumAnAr out of his unlimited and natural compassion, explained the divine principles to whoever desired to learn the same. He also instructed the many AchAryas who were established by him to do the same. Thus he was glorified as "krupA mAthra prasannAchAryar" - one who is filled with compassion towards jIvAthmAs. From his times, this srIvaishNava dharsanam becomes to be known as emperumAnAr dharisanam and reaches great heights. emperumAnAr had innumerable sishyas. 74 AchAryas who were established by him, 12000 gruhasthas, 700 sannyAsis and many thousands of srIvaishNavas (men and women who were fully surrendered to him) were present during his times. Out of his large-hearted nature, he removed the restrictions that were there for initiating men and women into the sath sampradhAyam and seeing the sufferings of the bound souls, he established that any one who has a little desire for upliftment needs to be shown the true path. As said in "rAmAnjArya dhivyAgyA varthadhAm abivarthadhAm", he placed these divine orders for the upliftment of everyone. 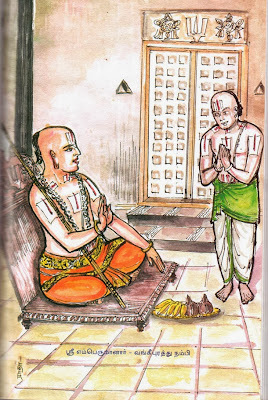 During his last moments, emperumAnAr gave valuable instructions which are usually called as charama sandhEsam (final instructions) to his sishyas individually and collectively. These are recorded in 6000 padi guruparamparA prabhAvam, vArthA mAlai, prapannAmrutham, etc. Apart from those, his direct instructions to vangi puratthu nambi is recorded in a grantham named "virOdhi parihArangaL" - Removal of obstacles/hurdles. virOdhi means obstacles/hurdles. parihAra means removal/elimination. This grantham contains 83 vAkyams (phrases/sentences) and a commentary for each of those vAkyam which are compiled by vangi puratthu nambihimself based on the instructions received from emperumAnAr. Each of these vAkyams relates to a particular aspect of philosophy, practice (sleeping, eating, etc), etc and the commentary by vangi puratthu nambi explains in detail the various intricacies for each of those aspects. For srIvaishNavas, this grantham is of great value as it brings out minute details of many day-to-day challenges we face now. In every action of ours and in every situation, we may have various doubts in our mind on how to conduct ourselves properly. This grantham clearly outlines our proper conduct and dealings with great clarity. This grantham was originally verified by srIsaila aththangi thirumalai srImAn srI U. vE vidhwAn thiruvEnkata thAthAchArya swamy and published by bhAgavatha vidhEyan bhAshyam rAmAnuja dhAsan in circa 1914. There is a brief English translation for this grantham with the vyAkyAnam which was written by srI U. vE. BSS iyengar swamy. srI U. vE. V V Ramanujam swamy, has written detailed explanations for this vyAkyAnam. On seeing the English translation of this grantham by srI U. vE. BSS iyengar, He acquired the mUlam (source) written in telugu script from him and with the help of srI U. vE. Dr. M Varadharajan swamy, he got the mUlam (source) written in thamizh script. Subsequently, he wrote detailed explanations for the vyAkyAnam and released them as part of his yathirAja padhukA magazine as a series. Eventually he published this grantham as a book and released the same in April 2010. He also recollects with gratitude about the many discussions he had on this subject matter with vAnamAmalai vidhwAn srI U. vE. N S Krishnan iyengar swamy in the preface. 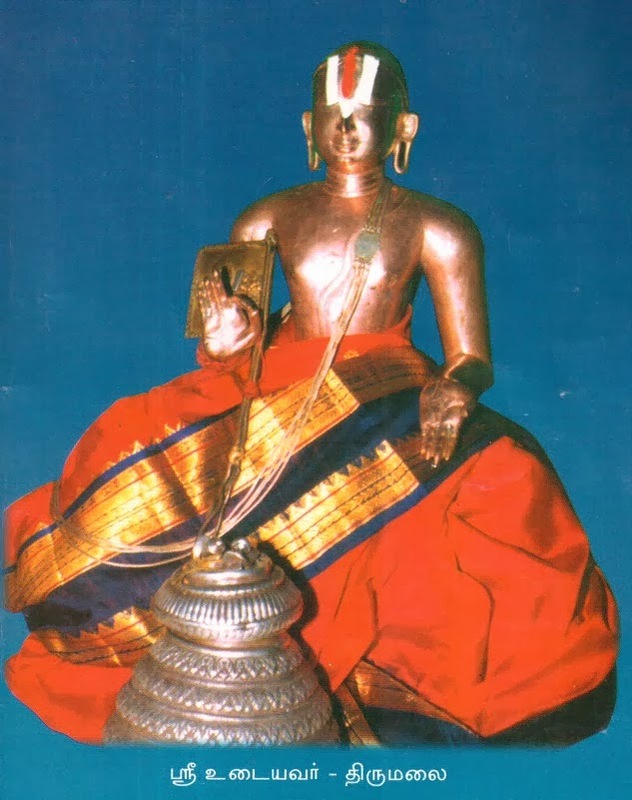 srImath paramahamsa ithyAdi kaliyan vAnamAmalai rAmAnuja jIyar has given his srImukam (auspicious note) to this publication with great appreciations to srI U. vE. V V Ramanujam swamy and his tireless contributions for our sath sampradhAyam. This introduction section is written mainly based on srI U. vE. V V Ramanujam swamy's introduction to the book. This will be a long series of articles where each topic will be discussed in detail. adiyen will attempt to present the principles as best as possible in simple English for the benefit of many srIvaishNavas who are eager to know about these principles in detail. By the grace of asmadhAchAryan, adiyen is beginning this work with the help of the simple thamizh explanations given by srI U. vE V V Ramanujam swamy. ANdAL nAchiyAr prays to emperumAn in the end of thiruppAvai that he removes the obstacles while serving him. She says to emperumAn "unakkE nAm AtcheyvOm maRRai nam kAmangaL mARRu" - bless me to serve purely for the pleasure of you alone (no tinge of desire to satisfy ones own pleasure while serving emperumAn). It is of great importance to clearly understand the obstacles we face in our day-to-day life and how to remove them so that we can desire to ultimately reach the state of existing and serving purely for the pleasure of emperumAn. Only few copies left with swamy at the moment. In the pAsuram from upadhEsa rathina mAlai , you have missed 'AriyarkAl'. where to get the Telugu version of this 'Virodhi Pariharangal', please let us know.....Although english translation is good, getting in telugu would be wonderful. Dont think there is a telugu translation for this grantham available. The copy which srI u vE VV Ramanuja swamy acquire was tamizh text written in telugu script.